I recently received the following email, so poignant in expressing what so many of us feel. I have been counseling girls with eating disorders for about a year, but I feel extremely inadequate. I tend not to treat the eating disorder, but rather to just treat them as teenage girls with problems. It is such a challenge to get them to believe they should eat when everything in them says food is the enemy. I just want to say to them. “Eat anyway. You’re not thinking straight right now and you’re starving yourself to death.” Eventually, I can usually say that, but I really need your book. Thanks for writing it.” -Linda B. And so it goes. This young woman speaks for the vast majority of psychotherapists who struggle with the very idea of managing these complex and hard-to-treat problems. Might you find yourself resisting treatment of these disorders? Might you feel compelled to refer these cases out of your practice? - The complexity of these disorders? - The patients’ resistance to healing? - The inevitably unpredictable course of recovery? cases out of your psychotherapy practice. Begin to experience professional skill-mastery and self-confidence in helping your eating disordered patients achieve what are typically evasive, though life-saving, recovery changes. Fill the ranks of a field that has, to date, known a shortage of qualified care-givers, leaving approximately two-thirds of eating disordered individuals undiagnosed and without adequate care. The information offered here holds the potential to turn these concerns around for you. This site provides the education, resources, and professional consultation you require to upgrade the quality of your care-giving and gain professional confidence in treating these challenging disorders. As you begin, or further, your eating disorder education here, you can count on more consistent and timely professional outcomes. Whether you specialize in ED treatment, engage with an occasional ED patient, or choose not to treat eating disorders at all, every therapist, nutritionist, medical doctor, psychiatrist, physical trainer and school counselor should be prepared to recognize their elusive signs, address their urgency, and refer the patient for care. These highly lethal disorders leave little margin for error in diagnosis and treatment; the earlier these diseases are recognized, the better the prognosis for recovery and the possibility for prevention. Patients, families, friends, but most of all, practitioners need to recognize and understand the risks of allowing ED to go untreated, even as they are likely to remain undisclosed as co-occurring syndromes, underlying other conditions for which the patient does seek care. Effective treatment requires skill mastery, heightened self-awareness and a facile use of the professional’s self vis-à-vis patients and families in healing these complex and integrative diseases. 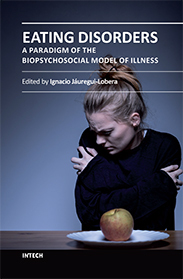 When treatment is not successful, the finger of blame invariably gets pointed towards the disease itself through the misconception that eating disorders are ‘incurable;’ towards an ‘impossible to treat’ patient population; or towards parents of child patients for having caused the problem or for not addressing it sooner. The reality is that when treatment outcomes are less than successful or when they fail, it is all too frequently the well-intentioned (and otherwise competent) health professional who drops the ball. As practitioners, most of you already have the skills you need. It is for you to learn when and how to offer the techniques and skills that you already have acquired; how to nuance the quality of your care-giving with mindful action, and clearly defined intentionality; and how to motivate clients through loving human connections, brain to brain, soul to soul, in connections that are themselves truly healing. By impacting the client’s emotional development, problem-solving, quality of life and physical function, self-regulation and self care, the work we do holds the potential to become transformational, saving and restoring lives and life quality now, and for generations to come. 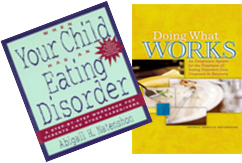 My recent book, Doing What Works: an Integrative System for the Treatment of Eating Disorders from Diagnosis to Recovery is an invaluable tool for treating practitioners. By offering a meaningful and practicable system of care, this “how to” treatment guide douses the fires of professional fear and resistance to ED treatment, inspiring enough interest and know-how within the treatment community to fill the shortages in the treatment ranks with competent ED experts. As a treatment ‘GPS’ mapping out the most accessible and workable routes, Doing What Works alerts and prepares the entire multi-disciplinary treatment team, including patients and parents, to anticipate and bypass inevitable detours and pitfalls intrinsic of ED treatment, securing a smooth journey through the tough passages of a complex recovery. Natenshon’s reassuring voice resonates with over 40 years of specialty experience and know-how, providing therapists the permission, incentive, vision and confidence they need to become self-starters within a demanding treatment process---and to help their patients do the same.